Xpelair Ventilation Solutions has been specified and installed by M&E contractor Emico to develop a bespoke natural and low energy ventilation and heating system for Little Ealing Primary School in London. 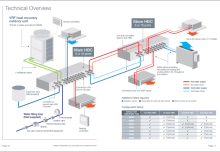 The company’s ‘CustomVent’ division worked in partnership with Emico to design, install and commission a highly efficient and state-of-the-art mixed-mode ventilation solution based on Xpelair’s marketing leading Classmate system. Steve Mongan, Head of Marketing at Xpelair, said: “The key ventilation requirement in any school building project is creating a cost-effective and energy efficient solution that provides a healthier and more comfortable indoor environment to help pupils and staff perform better. Little Ealing Primary School features 12 of Xpelair’s Classmate units and six high level XSV100 stack vents, providing heating and natural ventilation in accordance to Building Regulations Part F and Building Bulletin 101 to six classrooms. Steve continued: “The system is operated via a combination of CO2, temperature and time controls and features industry leading acoustic performance. It also minimises energy input and reduces carbon emissions by use of passive ventilation only for CO2 control. Summer ventilation is provided by low energy EC fans and heating by low pressure hot water coils and controls. Nick Parfrey, from Xpelair’s CustomVent team, commented that the Emico installation had been to a very high standard and this had led to a straightforward commissioning process.